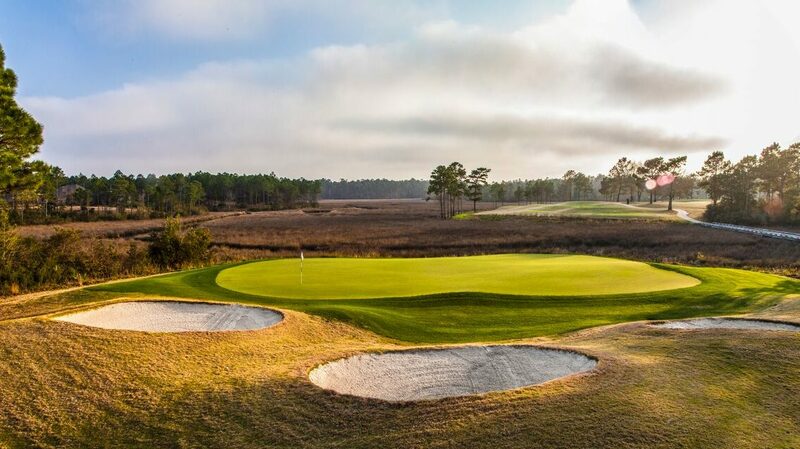 Shell Landing Golf Course was designed by Davis Love III and plays 7,024 yards of golf from the back tees for a par of 72. From back here, the course rating is 73.2 with a slope of 128. Shell Landing Golf Club features both a beautiful natural waterfront setting and some diverse topography. 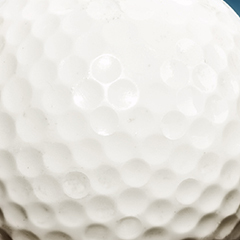 Water comes into play on eight holes and plays a role on most scorecards. Generous tree-lined fairways meander through the pine savannah, which is adorned with seasonal flowers. These well-sculpted fairways give way to large undulating greens that roll true and fast. You’ll find conditioning like many of the high-priced casino courses in the area at a fraction of the cost. 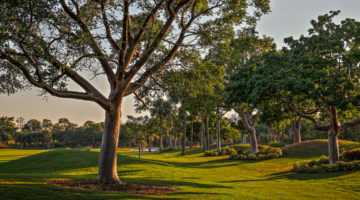 As you make your way around the layout, you’ll have the opportunity to commune with nature; it’s not uncommon during a round to see deer, alligators, rabbits, fox and a variety of birds. 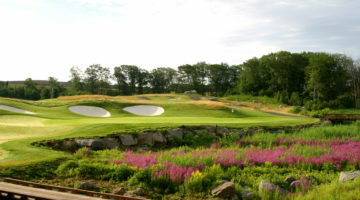 With five sets of tees, all levels of players will find Shell Landing to be a challenging and enjoyable place to play. Hughes is a native of Biloxi, MS and spent his childhood playing golf at nearby Sunkist Country Club. He attended the University of Southern Mississippi where he was named Player of the Year as a member of the varsity golf team. 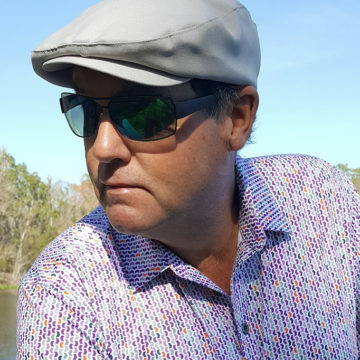 After graduation Hughes got into the golf industry on a full-time basis and in 1989 Hughes was named by the PGA as apprentice player of the year by the Mississippi Chapter. 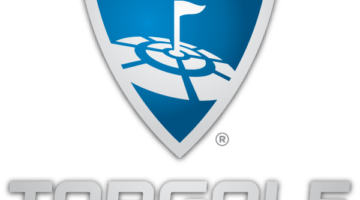 He has been a PGA member since 1992, having competed in and won dozens of tournaments. So it goes without saying that Hughes knows golf, especially in coastal Mississippi. He has been at Shell Landing Golf Club since the course opened its doors in 2000 and has seen both the good and the bad. 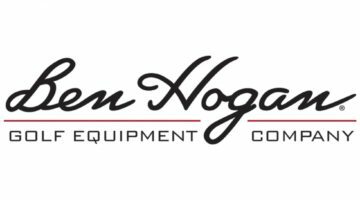 Shell Landing has been through some rough financial times and in 2012, Hughes and a group of investors purchased Shell Landing and nearby Hickory Hill Golf Club, where Hughes got his start in the golf business. 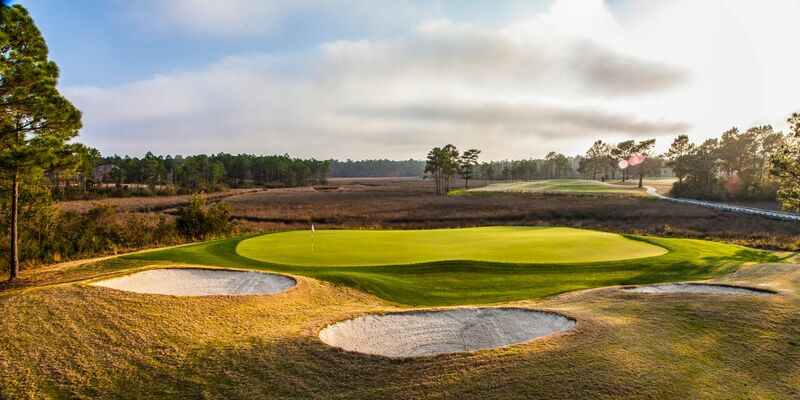 Golf Digest has been so impressed with the facility that they have recognized them on several occasions including naming Shell Landing among America’s Best New Courses. 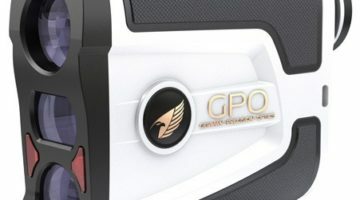 In 2003, the magazine ranked the championship design No. 5 in America in the Best New Upscale Public category, the only one in the top five that is located in the South. 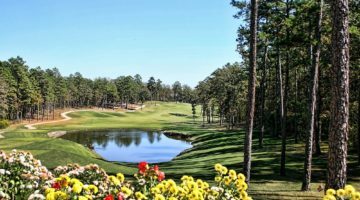 In 2007 Shell Landing was presented Golf Digest’s “Architecture Award’ in recognition of its outstanding design and named it among the “Best Golf Courses in the State.” In 2017 Golf Digest ranked Shell Landing the sixth Best Golf Course in Mississippi. Shell Landing is chock full of memorable golf holes. The course’s signature offering is the par 3 17th, which plays over 200 yards from the back tees. The tees are elevated and play downhill to the green. Don’t let the visual distractions fool you on this hole. All you can see off the tee is the marsh and the three deep bunkers that loom behind the green. The best advice you will get is to be sure and carry the marsh and hit the green! Par is a good score here. 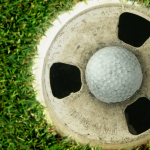 Another hole you’re not soon to forget is No. 9, a 370-yard par 4 that features a marsh that crosses the fairway. Longball hitters may be able to carry it, although for my money, the risk outweighs the reward. 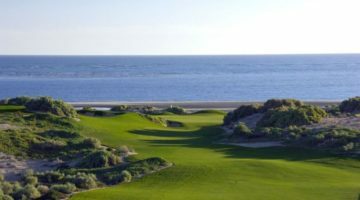 Play something less of the tee, short of the creek and you’ll leave yourself a short approach to an elevated green protected front and back by beautiful, white sand bunkers. The par 5 third is one of the most beautiful holes on the entire course. It’s a modest double dogleg that plays well over 500 yards. Fairway bunkers guard the right side of fairway off the tee and if you play it too safe, you may just find the woods. Place your tee shot down the left center of the fairway with a power fade and you’ll be in good shape to play your second shot. You’ll want to hit it down the right side of fairway towards the mounds with a slight draw; this will leave a full third shot into the green. Should you decide to go for the green in two, be sure to carry the large pond that fronts the green. Other amenities at Shell Landing include a full length 15-acre practice facility where you can hit every club in your bag, as well as a massive putting green. There’s also men’s and women’s locker rooms, club storage, and top of the line rental clubs. After your round, be sure to stop by the Landing Bar and Grill, which has something for everyone. At first glance, the menu is not all that impressive, as a matter of fact, you could say it’s very limited. That may be the case but take a bite out of any item on the menu and you’ll be amazed. After all, what’s better: having a small menu and doing everything well or having a lot of choices, but nothing memorable? Their burgers are superb, the Philly Cheesesteak is something to write home about and their sandwiches are impressive. And by the way, the hot dogs are the best around and their prices will let you leave with enough to pay off your bets. The Landing Bar and Grill is open to the public and is open for lunch seven days a week from 11 AM – 3 PM. It’s also available to host special events. Shell Landing Golf Club also offers golf memberships. 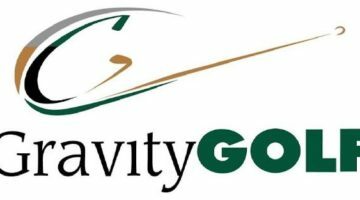 Members receive discounted visitor passes, advance tee times, complimentary range balls, a 20-percent pro shop discount, inclusion in member events and tournaments with any level of membership package. Choose from Gold Level, Senior Level, Junior Level and Weekday Primary membership packages. Membership packages range in price from $55 to $159 per month for a single membership. Last Word: Shell Landing offers true southern hospitality and gives you the total Gulf Coast golf experience without breaking the bank. Every hole is unique, and you need to think your way through each shot. 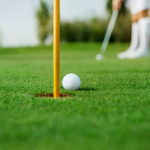 The greens are some of the purist in the area and knowing them will help you tremendously. They want to see to it that you enjoy yourself and come back again. 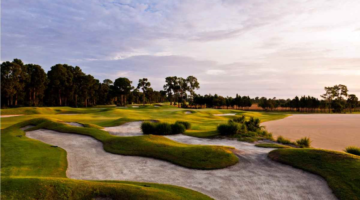 On your next visit to Mississippi’s Gulf Coast, be sure to play a round at Shell Landing. 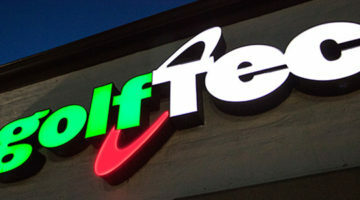 Visit them online at www.shelllandinggolf.com.